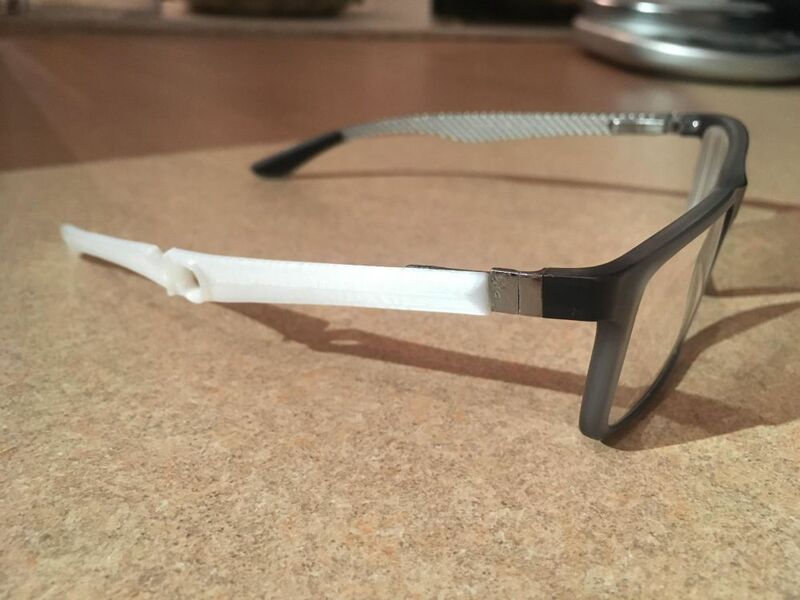 My roommate’s glasses broke a while back and he was holding them on his head with a piece of increasingly disheveled twisted wire, so I 3D printed him a new ear piece for the glasses with “YO” written on the side at his request (in comic sans as a joke). The piece was printed flat on my Creality CR-10 in the white PLA that came with the printer and then shaped with boiling water afterwards. Because of where the originals broke, the new ones are still able to open and close like regular glasses and all my roommates were freaking out about how good the ear piece came out (though they were a bit drunk when I finally handed it to them, so they may have just been overexcited…). Apparently, they were impressed how well the bend in the new ear piece matched the original glasses and how ‘legit’ they looked. Print info: layer height of .2mm, walls .8mm thick and infill at 75%. The final piece weighs about 2 grams and it only took about 12 minutes to print, so I spent that time watching the print and dancing around the kitchen like a weirdo. I did something not totally terrible on my 3D printer!